When it comes to helping a customer choose a tea, whether a tea geek or a neophyte, the folks at Remedy Tea in Seattle have discovered that a huge number of variables go into the decision. Sure, taste governs all, but what about mood, how about the weather, the time, even what tea the person last drank? Maybe this guy wants to burrow into the dark and drizzly morning with something malty while his boyfriend wants an antidote of crisp herbs. 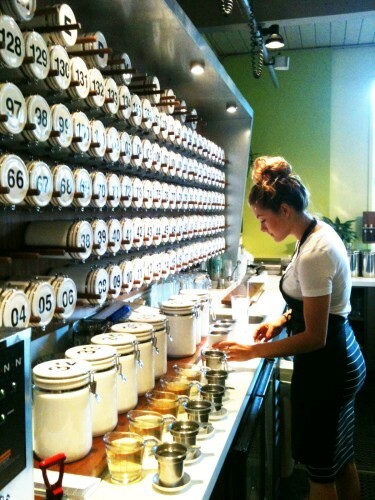 With 150 teas and tisanes to choose from, it’s a process that can be difficult for staff and intimidating for customers. The trick for Anthony Arnold, who owns Remedy Tea with his wife, Andrea, is to make it not just unintimidating but comfortable. To help, he turned to Seattle’s greatest beverage export. Anthony felt, tea was too often bound up in formality—whether it was the propriety of a Victorian-inspired teahouse or the ceremony of a Chinese-influenced shop—and this didn’t allow customers to be at ease. He wanted a space and a service that invited customers to, of course, enjoy great tea but just as importantly settle in. It needed to feel like a coffee shop. Among tea’s great joys is its bountiful variety. By eschewing the often stilted trappings that surround tea, by offering customers a space grounded in a familiar experience, Remedy can present tea not as overwhelming but as ready to please any taste a customer may have. 3. Services: All the teas are presented on a white tray in a pot with a candle, a tea warmer, and a double-walled glass cup. Customers are given a hand in the preparation by way of a silent timer. “That’s a big part of tea,” Anthony says. 5. The Fridge: For cold drinks, Remedy serves local kombucha, sodas, and Rachel’s Ginger Beer. They also have house-made tonics. 6. The Corner: This is where Remedy processes low-volume online orders. The packaging takes place in the mornings and during off hours. 7. Bakery Case: Here, maybe more than anywhere else, Anthony followed the lead of coffeehouses. “The bakery case is part of sending those signals that hey, this is a café, you’re comfortable here,” he says. Remedy sells many vegan, gluten free, and other niche products. “We have classics in there,” Anthony is quick to say. They even serve thick slices of toast. 8. Steamer: From the start, Remedy has made tea lattes. They prepare dense concentrates that mirror espresso. The steamer gets put through its paces especially hard in the winter. 9. The Staff: While Remedy takes its aesthetic inspiration from cafés, its staff take their cues not from baristas but from bartenders. 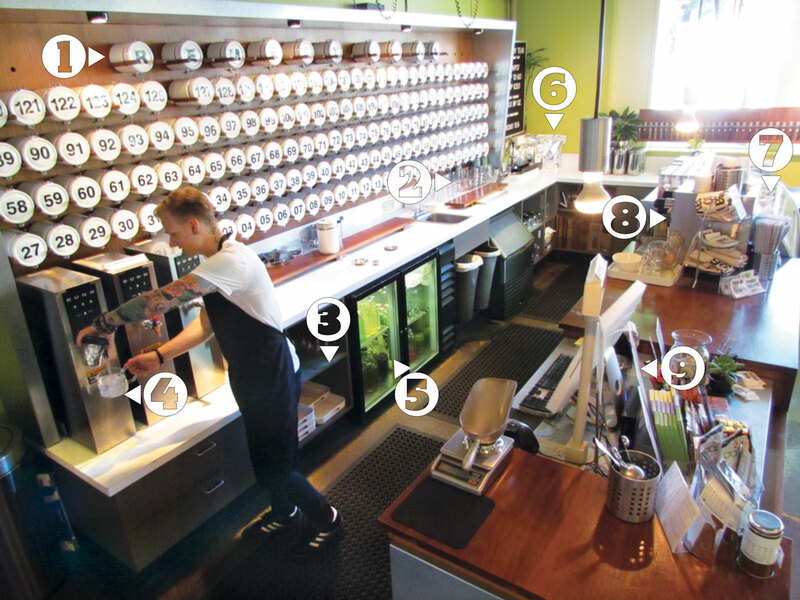 With such a huge selection, the staff asks questions that will guide a customer toward a tea or blend much as a bartender will help a patron pick a cocktail.